About 2,100 of the state's civilian defense workers will be forced to take up to 11 days off without pay, resulting in a $7 million loss. WASHINGTON – More than 2,000 Mainers and their families will feel the effects of Congress’ stalemate over federal spending next week as furloughs begin for Department of Defense employees across the country. And with no resolution to “the sequester” in sight, there is growing concern that the across-the-board spending cuts could be permanent. 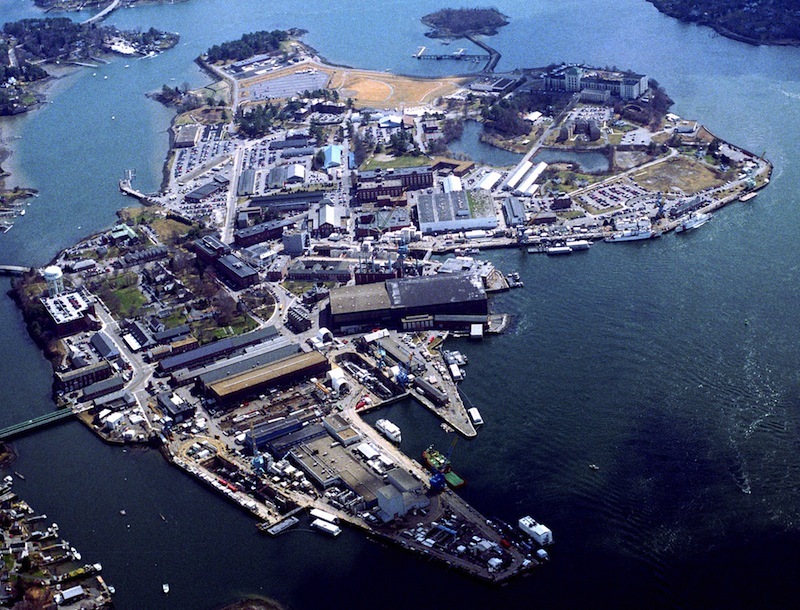 An aerial photo of the Portsmouth Naval Shipyard in Kittery, Maine. More than 2,000 Mainers and their families will feel the effects of Congress' stalemate over federal spending next week as furloughs begin for Department of Defense employees across the country. Among those affected: 678 support employees at the Portsmouth Naval Shipyard. While most Americans have yet to feel a major pinch from the budget cuts that began March 1, many federal employees have been forced to take days off without pay. Beginning Monday, more than 600,000 civilian employees of the Department of Defense will be furloughed for as many as 11 days, roughly one day per week through September. • 533 “federal civil service technicians” with the Maine Army and Air National Guard in Augusta, Portland, Bangor, Auburn and Houlton. Many of those workers are the mechanics and technicians who maintain and repair National Guard vehicles and aircraft. • 600 employees of the Defense Finance and Accounting Service office in Limestone. • 621 civilian Army employees across the state. • Nearly 200 Navy employees who work in the Supervisor of Shipbuilding office at Bath Iron Works. • 678 support employees at the Portsmouth Naval Shipyard in Kittery. Because of the potential for overlap in some of those categories — such as between the National Guard and the Army — it wasn’t possible to calculate an exact figure for Maine. But a state-by-state breakdown released in May by a member of the U.S. House Appropriations Committee estimated that furloughing 2,100 defense employees for 11 days each would have a $6.9 million economic impact in Maine. The Defense Finance and Accounting Service in Limestone processes paychecks for defense department employees, active duty personnel and military retirees. Agency spokesman Tom LaRock said many employees will take Fridays or Mondays off, but supervisors are trying to spread out the furloughs to minimize their effect on operations. The Portsmouth Naval Shipyard is an example of how a worker’s job description dictates whether he must take time off without pay. This spring, Defense Secretary Chuck Hagel announced that most employees at the Navy’s four shipyards — in Maine, Virginia, Hawaii and Washington — will not be furloughed because their jobs are considered “critical” to ensuring the readiness of the fleet. That was welcome news to the roughly 4,700 civilian employees who maintain nuclear-powered submarines at the shipyard in Kittery. But the 678 people who work in 15 support units — called tenant commands — doing things like providing supplies, engineering and facility maintenance are subject to furloughs, said shipyard spokesman Gary Hildreth. “These commands provide necessary support to the shipyard’s mission of overhauling, repairing and modernizing the U.S. Navy’s nuclear-powered submarine fleet,” Hildreth wrote in an email. U.S. Rep. Chellie Pingree, a Democrat whose district includes Kittery, cited the shipyard as an example of why she opposed the sequester when it was devised as a way to force Democrats and Republicans to find an alternative, more discriminating way to reduce the federal deficit. If Congress allows the sequester to stand over the next 10 years, the defense department will take half of the $1.2 trillion in budget cuts. Pingree is married to S. Donald Sussman, majority shareowner of MaineToday Media, publisher of the Portland Press Herald, the Kennebec Journal and the Morning Sentinel. Momentum in Congress to address the sequester appears to have diminished as the months have passed.